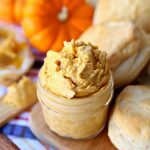 Whipped Pumpkin Spice Butter Spread has all your favorite fall flavors whipped together in creamy butter spread perfect for bread, biscuits, pancakes, and more! From breakfast to dinner, this sweet butter is a must-make recipe! Using an electric mixer, whip butter for 30 seconds in medium bowl. Add spices and continue to whip for about 15 seconds. Slowly add in pumpkin puree, honey or maple syrup and vanilla. Spoon into a bowl or jar. Can be refrigerated in airtight container for up to 4 weeks after preparing.